Well. Didn't go exactly as planned (cause the fourth grade class I had right before them ... the sub for the afternoon didn't show so we had their activity and checkout and then I had to get the kiddos to their specials before my assistant came back from her lunch duty) but what does? I had to leave them as they were cleaning up and go get that fourth grade class from specials and delivered to other fourth grade rooms ... while my assistant checked out a kinder class ... yeah, it was that kind of afternoon :/). 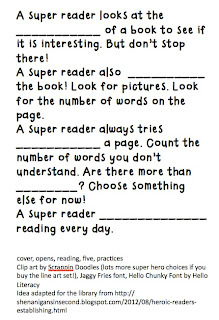 We read the first 5-7 pages of SuperDog, Heart of a Hero (Thank you, S.P. for the book suggestion!) . 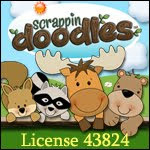 It talks about a dog who wants to be stronger so he works hard and practices and exercises to build his muscles. I didn't read the whole thing cause it's kind of long. 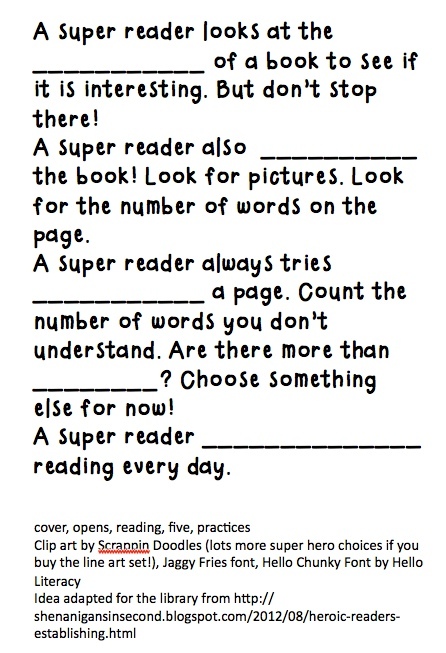 Then we filled out a note page and talked about how a super reader has to practice and the things to look at when choosing a book. So. Lessons learned. One ... they can sit at the tables long enough for what we actually got to read of SuperDog. We often avoid the tables because they are so not made for smaller people. Barely made for fourth and fifth grade. But it would have been better because we wasted time and attention handing out pencils and clipboards. Then I had some books for them to look at and "sort" into too easy, just right, and too hard. But they got distracted by cool pics in the "hard" ones. Oops. Lesson learned for me. Don't "TEST" this lesson so quickly. Let them color and design their capes! "Lost" (was it really lost?) time looking at too hard books. Choosing a just right book always requires repetition, no? I freehand cut the capes out of butcher paper. It took longer to pull it off of the roll and fold it than it did to cut. I won't lie, though ... it did take longer than I wanted it to. If you can get a parent or volunteer's help YAY! Download my version (so not necessarily the best wording but oh well!) here. This idea was totally adapted for the library from here. SERENDIPITY. I love Goldilocks and the Three Libearians but ... let's also be honest ... was getting a little tired of it. Plus A. J.U.S.T. R.I.G.H.T. B.O.O.K. is just too complicated. Thanks for sharing this great idea, Ms. O! How much time did this entire lesson take? Keep on being awesome! WELL ... as I plan on streamlining some ... I think about 35? We actually took about 50 but if you skipped the handing out clipboards and sorting books (cause it was way too distracting for this first of the year lesson ... choosing a just right book takes PRACTICE and some self-discipline) it would take less time. Could give them more time to color the cape if you want. Or read more of SuperDog (we didn't read the whole thing by a long shot ... I told them they could check it out next week if they wanted to know what happened next!). Check out the Shenanigans in Second link for a nice anchor chart. I hardly ever do those and I should ... but no easel. No walls. And seriously couldn't display them for every class anyway, right? But it's good.